If you want to watch The Meg, please consider renting or purchasing the movie through this amazon link to help us support the podcast. The Meg is a run-of-the-mill, but well-executed monster movie starring Jason Statham and the sovereign nation of China. Jason Statham plays Jonus Taylor, an expert rescue diver who is retired after a tragically failed rescue, which Jonus blames on a giant fish or something (but no one believes him). He is brought out of retirement after another diving accident befalls his ex-wife who was researching the deepest, hidden depths of the ocean. Before her video feed cuts out, she says “Jonus was right!”. The big fish ends up being a megalodon, a giant shark, that they inadvertently lead to surface waters. From then on, it’s a paint by numbers monster movie that hits every beat you would expect it to. The Meg also stars a cast of disposable characters played by Bingbing Li, a Chinese actress you might have seen in Transformers Age of Extinction, Ruby Rose channeling Aeon Flux, Rainn Wilson phoning it in, and others. 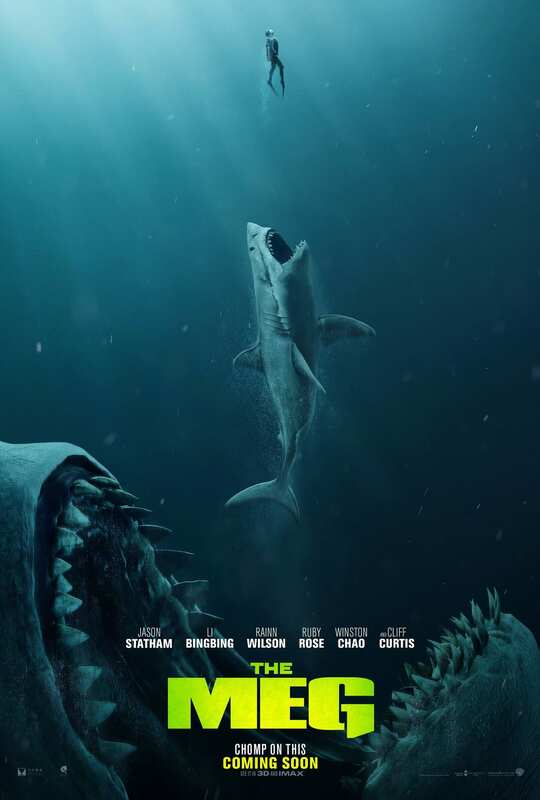 The Meg is an enjoyable movie if you don’t go in with lofty expectations for a movie about a giant shark that eats a bunch of people. It is the epitome of general audience popcorn fair, and an amusing spectacle. It hits all the marks, the witty banter is slightly less cringy than most generic action movies, but there isn’t anything notable that makes it better than average. There really isn’t much to spoil here. The shark eats many people, but not the protagonist. They kill said shark. The end. The only notable aspect of the movie is how custom tailored it is for the Chinese audience. Several of the main characters are Chinese, Mandarin is spoken throughout, and the main set piece action sequence at the end is on a Chinese beach. The strategy has paid off though, The Meg has made one and a half times as much as the domestic box office. Is The Meg Worth Seeing? The Meg would be a great movie to watch on cable. It’s not necessary to see it in theaters unless you are really into monster movies. It is a truly average popcorn movie that is tailored to mass appeal. The plot doesn’t have a lot of “bite.” All of the deaths are righteous or noble. In summary, This movie is great for middle-aged dads that like shark week and drinking beer. If you like dumb monster movies, then this will be a fine notch in your belt.